If you enjoyed your Clermont chiropractic visit with Kurt Michaux, please share your experience with our company by clicking below. Michaux Family Chiropractic is centrally located in the heart of Clermont, FL off of HWY 27. We have helped thousands of patients by providing high quality care through pain management treatment and wellness coaching. We provide a high quality of care for those suffering from back pain, neck pain, headaches/ migraines, shoulder pain, and other related ailments due to an car accident injury, personal injury or other chronic conditions. Our Clermont Florida Chiropractic clinic also offers advice on weight management, nutrition, detoxification, massage therapy and more to help each person find the state of wellness that they need in order to thrive. Our Clermont chiropractors, Dr. Kurt Michaux, brings a lifelong dedication to health to area patients through our chiropractic clinic. His personal story and own lifelong health problems led to an education in chiropractic care, which has then enabled him to dedicate his life to helping other people going through the same struggles. We have helped many people regain their lives through increased wellness. We treat patients who have sustained injuries from an auto accident and we also help with pain management for chronic conditions such as fibromyalgia. Our pain management team works to improve and maintain an optimal level of health in all of the patients we see. Often, Dr. Kurt can help patients who have never previously considered chiropractic treatment as an alternative for pain management and healthy well-being. One of the things that sets Michaux Family Chiropractic apart from others is our individual approach to patient wellness. Every person we treat is carefully evaluated to determine the right course of treatment for them. Whether a patient is suffering from neck pain, back pain, chronic headaches, fibromyalgia (chronic pain), a car accident injury, shoulder pain, or another painful condition, we can find the techniques needed for pain management and increased wellness. Those suffering from neck and back pain usually get the most from traditional adjustments from our Clermont chiropractor. By allowing the spine to become centered, we can help relieve pain for most people. From there, other services and therapies can be combined and added to treatment to increase the benefits of care. Michaux Family Chiropractic offers spinal decompression therapy, massage therapy, nutrition, rehab, mechanical traction and other cutting edge treatments. Our chiropractic clinic also offers pain management care to Clermont chiropractic patients of all age groups. From pediatric patients to seniors, our dedicated staff can help increase health and provide pain relief. Our team also offers wellness coaching to help patients stay well long after visiting our clinic. We provide nutritional counseling and other wellness coaching techniques to allow health to remain long after the initial injury has healed. Do not let your life be limited by chronic back pain or an auto accident injury! Clermont chiropractic patients and those in the Minneola, Davenport, Four Corners, Windermere and Groveland areas interested in scheduling an appointment or learning more about treatments that we offer may do so by calling (352) 243-7300. 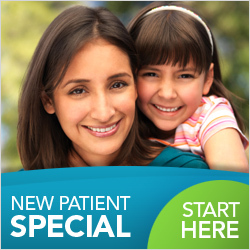 To take advantage of our New Patient Special, fill out form below!